“In his all-too-brief prime, Giuseppe di Stefano had one of the most sensuously beautiful tenor voices documented on recordings. It is the kind of beauty that has the power to move listeners, this writer included, to tears. But there is so much more to savor. Di Stefano’s diction both in his native Italian and French was exemplary, a gift he used to the utmost dramatic and musical effect. The young di Stefano also had a breathtakingly wide range of dynamics and colors, even when negotiating the most treacherous high notes. Sad to say, the magic was all too short-lived. It was not long before di Stefano began to try his hand at more dramatic repertoire, mercilessly pushing his lyric voice. That, coupled with di Stefano’s open approach to the passaggio and high notes, exacted its toll. To make matters worse di Stefano, by his own admission, was hardly the most disciplined individual when it came to pursuing a lifestyle and regimen that offered the greatest prospects for vocal longevity. But before I become too judgmental of di Stefano’s life and career choices, it’s appropriate to consider that, had the Sicilian tenor pursued the straight and narrow in all matters, he perhaps might never have been the electrifying artist of those halcyon years. In any event, Giuseppe di Stefano recordings from the mid-1940s to early 1950s are treasures to savor. And such treasures are what Immortal Performances gives us in this four-disc set. 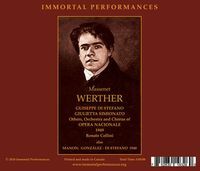 The Mexico City MANON and WERTHER, long available courtesy of various labels specializing in live recordings, are certainly not without their issues….The recorded sound on previous issues suffered from harshness, and volume and pitch fluctuations. But avid collectors have been willing to suffer these flaws in order savor the many glories. Di Stefano is in top form in both performances….Di Stefano sings the beautiful Act II ‘Dream’ with such melting beauty and artistry that the audience demands and receives an encore. And so it goes, as di Stefano’s interpretation and vocalism move from strength to strength. You could go a lifetime without hearing des Grieux sung with this combination of vocal beauty, artistry, and Italianate passion….The Mexican soprano Irma González is a first-rate Manon, one with a lovely and secure lyric voice, an artist who convincingly portrays the heroine’s transformation from innocent (but curious) young woman to tragic figure, ruined by her flaws. González’s French is not quite as idiomatic as is di Stefano’s, but she declaims the text with clarity and purpose. Giuseppe Valdengo is very much in his element in the lyric baritone role of Lescaut. Those familiar with Valdengo’s collaborations with Toscanini in various NBC Symphony Orchestra opera broadcasts will not be surprised that the Italian baritone’s Lescaut is beautifully sung, and interpreted with detail and panache….As an appendix to the Mexico City MANON, the Immortal Performances set includes excerpts from di Stefano’s March 15, 1947 La Scala debut, in an Italian-language performance of Massenet’s opera. Di Stefano is once again in magnificent voice, and he is joined by the marvelous soprano Mafalda Favero, also in superb form as Manon. If these excerpts document a more overtly passionate, Italianate view of MANON, they are no worse for that, and document an historic moment and real sense of occasion. The 1949 Mexico City WERTHER offers no pretense of a restrained, Gallic approach. 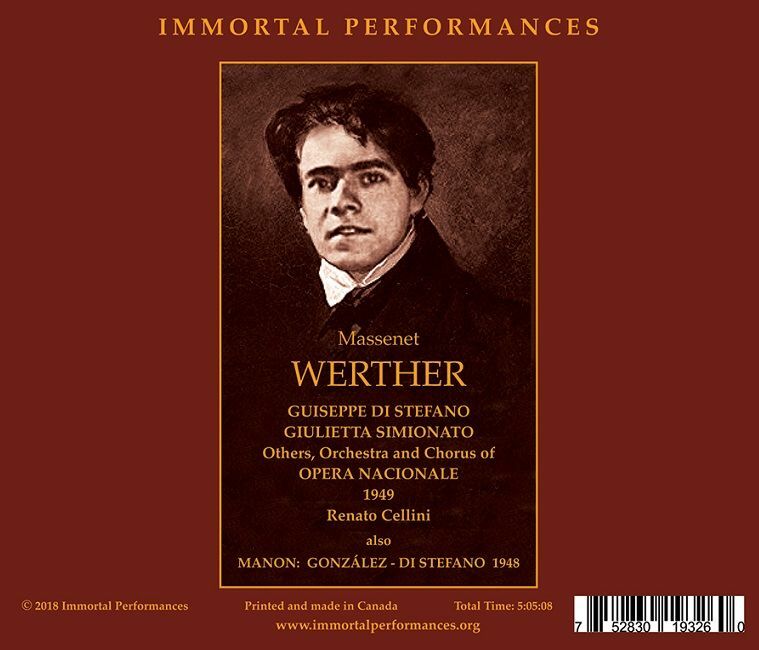 The performance, sung in Italian, is very much in the verismo mode….But even those who prefer WERTHER sung in its original language and the French operatic tradition should seize the opportunity to hear the young di Stefano (Werther) and mezzo Giulietta Simionato (Charlotte) in absolute top form, giving their all for an ecstatic audience. The supporting cast is more than adequate, and Cellini once again leads a performance that brims with energy and momentum. The set concludes with arias performed by di Stefano in early 1950s Standard Hour radio broadcasts. Unlike the Mexico City broadcasts, these are in fine sound, and a wonderful document of di Stefano at the apex of his career. The sense of joy, both for di Stefano and his studio audience, is palpable as the tenor lavishes his voice and passionate delivery on the various familiar arias. “It’s…the orchestral detail, and indeed the luster of the string sound, that enables this Manon recording to shine, supporting the voices with real intensity. Moments of possible crowding (the opening of the fourth act, for example) are rendered with no distortion….Despite heavy cuts to this performance, it remains a ‘must-hear’ for the sheer strength of the singing. 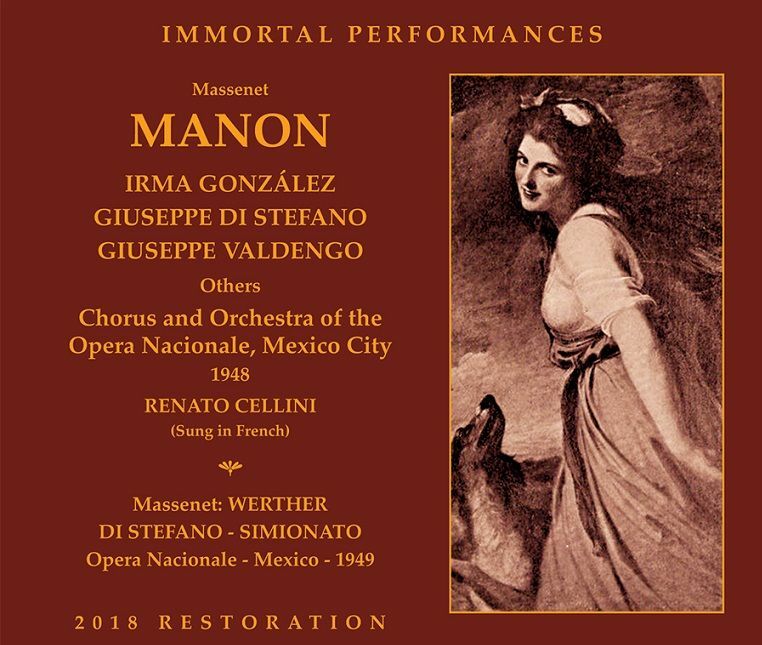 Renato Cellini is a superb conductor….Time seems to stop, though, with the arrival of the Manon, Irma González, and her aria ‘Je suis encore tout étourdie’, which finds her in beautiful, sensitive voice; later, when we get the measure of her immaturity, she embraces the role completely, convincingly. Of course ‘Adieu, notre petite table’ is her moment to shine, and González does so, radiantly and heart-stoppingly, as she bids her regretful farewell to the past. The way she holds the tension towards the end of the third act is positively mesmeric. Hers, with the exception of moments when the score requires her to fling out notes, is not an extrovert reading. It is interior, heartfelt, and sophisticated. Given the scarcity of commercial recordings of González, this is a ‘must-have’ just for her alone. As Lescaut, Giuseppe Valdengo is beautifully strong, his ‘Ne bronchez pas, soyez gentile’ a model of Massenet style, his diction impeccable….In this Immortal Performances transfer [of the La Scala performance] we can hear how Favero can thin her voice to a near whisper, too; the audience’s explosive reaction is eminently understandable. Di Stefano’s Des Grieux is absolutely her equal in expressive depth; another lesson is how equally at home he seems in both Italian and in French in this piece. Giulietta Simionato is a splendid Carlotta (Charlotte), every inch di Stefano’s vocal and dramatic equal, positively gripping in her long passages towards the close of Act I. If the passions of her act III Letter Scene seem more identifiably Italianate in the higher dynamics, there is no denying her impressive presence (the phrasing at the lower dynamic levels is more authentically and fragrantly French)….